This Harry Vroman portfolio of Saguaro Lake appeared in the January 1957 issue of Arizona Highways. Russ Glindmeier was so taken by a photo in this month's Arizona Highways that he set out to re-create it — 60 years later. "I was captivated by the double-page spread photo of Saguaro Lake in the March issue," Glindmeier writes in an email to Photo Editor Jeff Kida. The photo was published in our January 1957 issue and shows the lake's marina, where Glindmeier is a long-standing member of the "great boating fraternity" described in that issue. Glindmeier was out on the lake last week, and before heading home, he set out to find the place where Harry Vroman, who made the 1957 photo, set up his tripod. "My mission was to replicate his photo as it would look in modern day," he says. "I crawled among the boulders, looking for the particular rocks in the foreground of Harry's photo. Once I found them, I then attempted to compose the same image." He says he didn't get as close as he'd hoped, but we think he did pretty well. The photo at the top of this post is Vroman's original, and here's a GIF that matches his shot up with Glindmeier's present-day photo. Glindmeier shot his photo on a Nikon D800E, using a focal length of 19 mm. He notes that Vroman may have stood a bit farther back from the rocks and used a slightly longer focal length. Regardless, these two photos are an interesting look at how the area has changed over six decades. Thanks for sharing, Russ! Saguaro lake. Then and now. 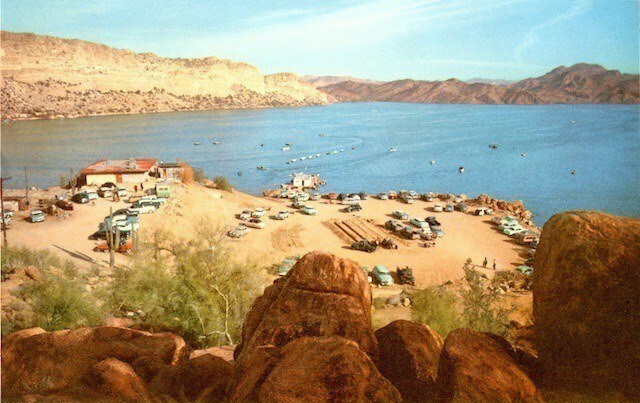 One of my best memories of visiting relatives in Phoenix in the mid to late 60s was that of going to Saguaro lake for the day. I am sure it fostered the love I have always had of the Arizona Country side.